Our 2.5-3 tog personalised baby name sleeping bags are a great baby gift and an amazingly practical one too. Suitable for standard rooms (16-20°C) to be used all year round. No more kicking off their blankets. You just zip them into their name grow bag and know they will remain warm and cosy as they snooze. Mums designed these name sleeping bags so we know they work well in real life, as well as impressive personalised baby name grow bag gifts. Firstly it has a very long zip (1m +) all around that allows it to open out in half for ease of access. When it's fully open it looks like a butterfly. This is perfect for putting babies to sleep with less chance of disturbing them when you zip them up. Very pleased with my purchase of a personalised sleeping bag for a colleague with a new born. She loves it. Would definitely order from bags of love again. Beautiful product, great quality and fast delivery. Would recommend . Excellent. The service, the product was amazing. Your baby sleeping bag is also great for keeping babies in if you need to pick them up in one swoop if they are crying for example, and the zipper also means it's fast to open. We use sturdy poppers at the shoulders to fasten. Make great baby presents personalised with the baby's name, on the front of sleeping bags for babies. They are great fun and mums and dads will be very happy too with their practical use. A baby gift idea that does a good job is always a welcome present for new parents. Your baby sleeping bag is made entirely by hand, here in our London studio. We print your photo design onto the polar fleece fabric using specialist techniques which bond the eco-friendly inks to the fibres. This is then cut to shape by our talented craftsmen before expert seamstresses stitch it all together. Plastic zips and press studs are used to make it easily accessible for you and your baby. Care: Machine washable 30°C. Permanent print will not wash out. Guaranteed for 200 washes and 2 years. We make the beautiful personalised baby grow bags, baby bedding, and snugly sleeping bags for babies especially. They are also useful as travel sleeping bags in a car seat. 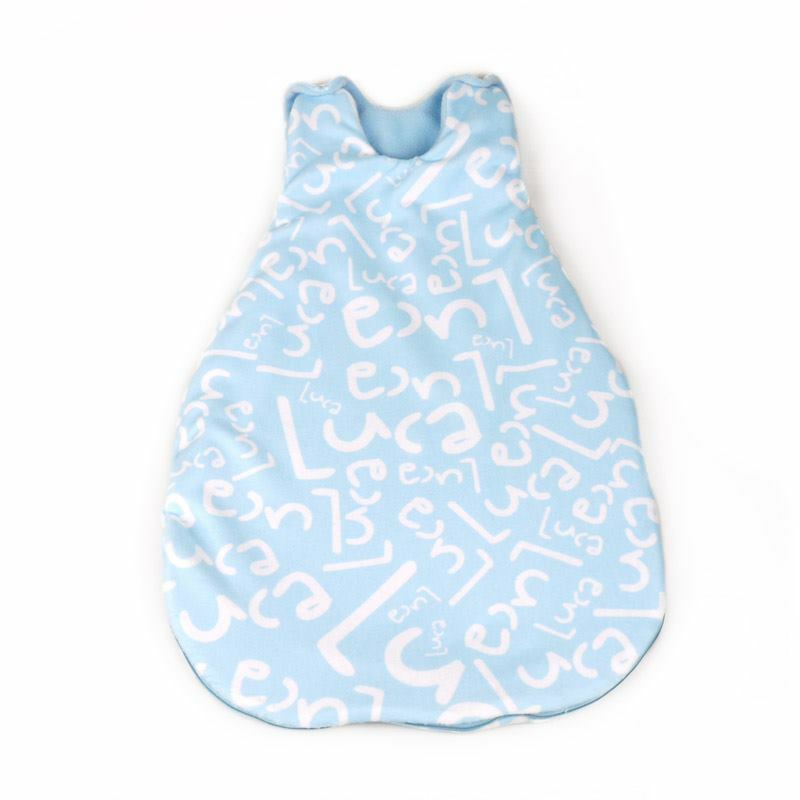 Snugly baby grow-bag with names printed on soft cuddle fleece makes for sleeping bags for babies. Sleeping bags for babies are ideal as a gift set with baby blanket, baby changing mat, and if you want a full nappy and changing bag set order with our small holdall. It's a classic selection. We custom-make all our baby gifts to order in our London facility, including these wonderful personalised baby grow bags. See our photo montage baby sleeping bags where you can create collage ones too.